The zoo is situated to the north of the island up near the reservoirs. Most of the animals are housed in imaginative surroundings and seem to be really well cared for. 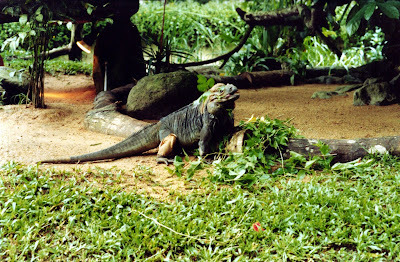 This is a zoo well worth visiting and if you have children allow a full day. My first thoughts on the night safari were that it would just be a zoo at night. It is so much more! It specialises in nocturnal animals and we were fortunate on our visit to see all but two of the animals. Probably one of the most spectacular is the dark cage you enter and as your eyes adjust you can see the massive fruit bats hanging there. Scary or what! there were certainly a few screams behind us as we went round.